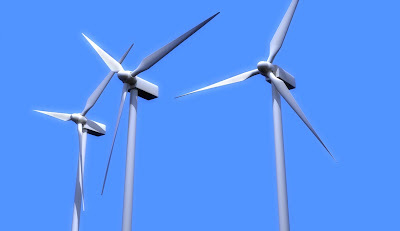 Gilead Power Corporation has submitted a proposal to construct a 9-turbine wind energy farm at Ostrander Point, in Prince Edward County, Ontario. Ostrander Point lies within the Ostrander Crown Land Block owned by the Ontario Ministry of Natural Resources (MNR) and is located just west of the Prince Edward Point National Wildlife Area, near the eastern end of Lake Ontario. The location of the proposed Ostrander Point Wind Energy Park is near the centre of the globally significant Prince Edward County South Shore Important Bird Area and only a few kilometres from the Prince Edward Point National Wildlife Area – the only National Wildlife Area specifically designated for its importance to migrating landbirds. This globally significant Important Bird Area (IBA) is designated for its high concentration of landbirds during migration as well as waterfowl. Additionally, Ostrander Point is a candidate provincial Area of Natural and Scientific Interest due to its significance for migrating birds and its rare alvar habitats (it is likely it has yet been officially recognized due to this controversial project). 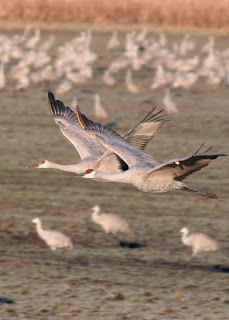 IBAs are some of the most significant sites for birds on earth. BirdLife International the global authority of bird conservation first developed this program in Europe, recognizing that some species of birds are dependent upon very specific places for their survival, and that some places are very important for the survival of large numbers of species. BirdLife is an international partnership, now active in over 100 countries. In Canada, Nature Canada and Bird Studies Canada are the official partners responsible for delivering the IBA program to Canadians. In many provinces, we work in partnership with provincial nature-conservation organizations such as Ontario Nature, to get the program to the ground and work with local individuals, groups, government official and First Nations to ensure that IBAs receive the attention and protection they deserve and need. 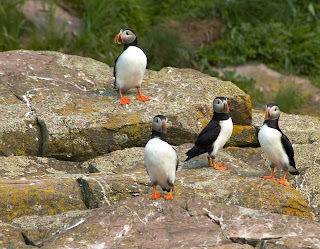 Betwixt and between meetings, Peter Rosenbluth and I were able find a guide to take us out to the coast of James Bay where so many birds congregate on their ways north in the spring and south in the mid to late summer and fall. Upon leaving Fort Albany, we encountered Gray Seals playing hide-and-seek with us in the brackish waters, still several kilometres from James Bay. On our 40 minute trip in the characteristic sleek wooden-hull boats used by the Cree to navigate the rivers and the bay, we encountered many Common Goldeneyes, a few Common Mergansers, some Black Scoters, white-winged Scoters, Red-tailed Hawks and Bald Eagles. Spray jumped the gunwales, hitting us on the face and getting our legs wet as the water was increasingly agitated as we moved further out the delta into the expansive James Bay where no longer we were sheltered from the cold wind. The mouth of the delta of the Albany is a myriad of islands with vast tidal flats and wetlands. It is a critical stop-over for several species of shorebird and waterfowl. Our guide explained how the vegetation along the coast is changing though - moving out into the the Bay each successive year. We came ashore on a beach of mud flats and sand. Tidal flats stretched out dozens of metres from the high-tide mark, as the tide withdrew, leaving pools of water amongst the gravel, glacial erratics, mud and sand. There is a slight rise in the land separating the tidal zone from vast salt marshes of rushes, sedges, and horsetail beds. While walking the shore, a flock of 20 juvenile Hudsonian Godwits flew directly over my head, landing just down the beach. The adult Godwits congregate in huge numbers in the IBA in late July and August, laying on layers of body fat to fuel their flights to Southern Brazil, Argentina and Chile. In September, the young of the year come along, also building up in number before their more lazy departure which lasts into October. As many as 10,000 Hudsonian Godwits, about 20 percent of the global population, use this site as an important stop over. In the spring, some even stay around to nest, according to local residents. We also observed Dunlin, Snipe, Greater Yellowlegs, and Black-bellied Plover, but only in small numbers. 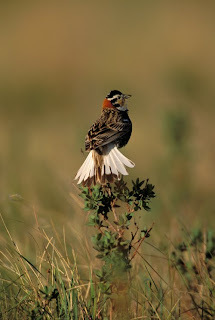 The most common and widespread birds at this time of the year are Horned Larks and Lapland Longspurs. They are everywhere along the shore, feeding on something, and constantly moving and being stirred up by us, a blowing leaf, or simply their irrepressible urge to move. The IBA is truly a sight to behold, but also was our guide. A traditional hunter/gatherer, he knew all of the species, (not just birds) was able to identify them without binoculars both by sight and the soft sounds they uttered. He is one of many hunter gatherers in the Cree communities like Fort Albany and Kashechewan who know the land, river and coast better that anyone. It was a great privelege to visit the coast with him. On our return, we observed more seals, a Peregrine Falcon, and a few Rough-legged Hawks along with one of the species that the coastal Cree communities depend upon and drives their annual spring hunt, the Canada Goose. Yesterday BP and the US government announced that the oil spill in the Gulf has been tamed, more than three months after oil began gushing into the sea. Capped a few days earlier, their latest reports are that about 75% of the almost five million barrels of oil that spewed into the Gulf had been eliminated – roughly 25% was “dispersed”, 25% had evaporated and 25% was scooped up by all of those barges. That leaves only about 1.25 million barrels, about five times more than the Exxon Valdez spilled into Prince William Sound in Alaska 20 years ago. The so-called dispersed oil is turning up in water and sand samples at toxic levels, but officials are not talking about this. It appears as if the “out of sight, out of mind” approach is taking hold. In fact, a seemingly contradictory federal report released Wednesday indicated that roughly half of the more than 200 million gallons (750 million litres) of oil that gushed from the well before it was capped could still be in the gulf environment in some form as tiny dispersed droplets, tar balls, surface slicks or oil buried in sand and ocean sediment. Yet even as the clean-up efforts continue, it seems that Canada’s government is ignoring some of the lessons of the Gulf disaster. Today, the Globe and Mail reports that Chevron has been awarded rights to explore a 205,000 hectare deep water parcel in the Beaufort Sea for oil by Canada’s department of Indian and Northern Affairs. This award was granted despite the National Energy Board’s hearings that have yet to start on Arctic offshore drilling, called in response to the Gulf oil disaster. Chevron and its buddies, including Exxon and BP, were pressuring our government to further relax our already lax regulations for drilling onshore in Canada’s Arctic by removing the requirement for companies to demonstrate capacity to drill same-season relief wells. They argue that they have a new technology that makes the relief well unnecessary. Heard this before? Can you imagine a Gulf-like leak in the Beaufort with its very small ice-free window – Mackenzie delta nearby, birds, sea mammals, fisheries, and indigenous communities that live off the sea and the land? This is exactly the wrong approach Canada should take to development in the North. Now is not the time to relax offshore drilling regulations. Rather than do away with the requirement to have advance plans for drilling relief wells in case of a spill, oil companies should be required to actually have relief wells in place before working wells are built. Also, blow-out preventers of the type that failed in the Gulf should be tested regularly. Unlike the United States, Norway and Britain, Canada lacks a regulatory process governing whether or where oil and gas development can happen in the Arctic. Licenses are granted, and contracts signed with oil and gas companies before any environmental assessment by the NEB takes place. The result: exploratory licenses exist in environmentally sensitive areas in the Beaufort Sea, where a blowout would have immediate negative effects on the delicate ecosystems there. Strict regulations, and the will to adhere to them, are absolutely essential for safe, sustainable oil and gas development off of Canada's shores, and in the Arctic. On June 25, the Ontario government posted a discussion paper to inform proposed regulations to govern the development of offshore wind facilities in Ontario on the Environmental Registry. There is a 60 day comment period – extending over much of the summer. The basic tenant of the discussion paper is imposition of a five kilometre exclusion zone from the shoreline of the Great Lakes and other inland lakes such as Lakes Simcoe, St. Clair, Nipigon and Lake of the Woods. The exclusion zone would also apply to large islands. In addition, wind energy proponents would have to conduct site-specific studies to assess potential impacts and implement measures to mitigate any potential impact to ecological features. 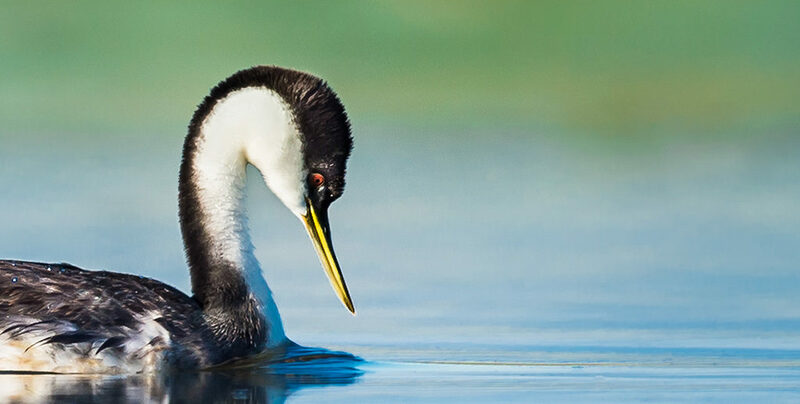 While the devil is always in the details, a five kilometre exclusion zone should exclude wind facilities from the most significant areas for birds and wildlife on the Great Lakes on other lakes in Ontario. Nature Canada and Ontario Nature have been advocating exclusion of wind facilities from Important Bird Areas, (IBA) and migratory corridors. Most IBAs on the Great Lakes and other Lakes in Ontario would be protected within this five kilometre exclusion zone. 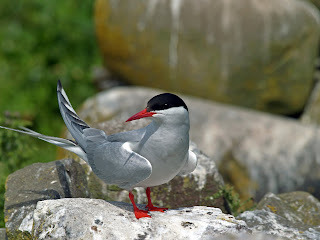 The near-shore and coastlines also tend to be the most significant area for migrating and feeding birds. There are some areas beyond the five kilometre buffer that are important for birds or which might fall within a migratory corridor, but in general, those areas will be well known, and exceptional (e.g. Pelee archipelago in Lake Erie, Three Sister Islands Lake of the Woods, islands in extreme Eastern Lake Ontario). The requirements for site-specific assessments should pick these areas up. That said, an effort needs to be made to map migratory corridors as soon as possible before proposals get the green light. Much less understood is how offshore facilities could impact bat populations. Highly technically challenging issues of monitoring impacts and mitigating threats that could occur when weather conditions conspire with a particularly heavy migration movement – (e.g. – low ceiling forces migrants into lower flight paths through turbine blads) need to be addressed if we are to have confidence that offshore wind facilities are not inflicting an impact on specific populations of wildilife. Also the complex assessment of cumulative effects of numerous offshore and on-shore projects in Canada and the United States must be considered and factored into approvals of specific projects. Nature Canada will carefully assess this policy and provide detailed comments to the government of Ontario. That said, the first impression is that this is a positive move that should protect wildlife, particularly birds, from the potential damaging impacts of wind facilities. Hey, it’s Migratory Bird Day – more or less, so let’s celebrate! On Saturday March 27, in Leamington, Kingsville and Harrow, Ontario, Southpoint Inc, a wind energy company based out of Leamington, is holding public meetings on its proposal to build over 700 offshore wind turbines between Rondeau Provincial Park and Holiday Beach Important Bird area on Lake Erie, and off the southern shore of Lake St Clair. 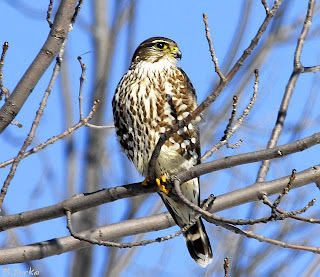 These developments are within, or proximate to, a cluster of globally significant Important Bird Areas (IBAs) including world famous Point Pelee IBA, Greater Rondeau IBA, Holiday Beach/Big Creek IBA, Pelee Island Archipeligo, and Eastern Lake St. Clair IBA. This area is a rare a point of convergence of the Atlantic and Mississipi flyways, the major bird highways followed by hundreds of millions of birds flying north into central and northern Canada in the spring and south after the breeding season in the fall, in some cases as far away as Tierra del Fuego. In other words, the area where the wind turbine density will be highest is perhaps the most significant migratory pathway in inland North America. Lake Erie and Lake St. Clair are also prone to severe weather and fog, which are conditions that are known to amplify the potential for migrating birds to collide with structures like wind turbines. In addition to these concerns for birds, local residents, including officials from all levels of government, are opposing this proposal over fears of contamination of drinking water from the turbine installations. Construction activity will disturb the bottom sediments of the lakes which contain extremely high levels of toxins and known carcinogens from heavy industries upstream. Due to the nature of the Ontario Government’s Green Energy Act, the door is wide open to encourage green energy. While this piece of legislation is certainly laudable, it can do as much damage as good if not applied thoughtfully and with care to protect biodiversity and cultural values like clean water. We believe that in fairness to the wind industry, wind industry companies should not be wasting their resources on proposals and undertaking justification studies in areas where clearly the projects would undermine biodiversity and cultural values. Clearly, the Southpoint proposal would do this as it is currently framed. The Province needs clear policy on where wind energy is to be encouraged and where it must be excluded. Concerning off-shore turbines in the Great Lakes, it must also be remembered that the Great Lakes are a shared resource with the United States of America. Several states border the Great Lakes and share the waters. Michigan already has guidelines with regard to offshore wind installations that, if applied in Ontario, would render the Southpoint project entirely unfeasible. We cannot have a pell-mell approach to industrializing this common resource with one jurisdiction upholding high protection standards and another lacking in standards. The International Joint Commission was established for this exact reason, yet proposals like Southpoint’s are forging ahead and the provincial government appears to be averting its gaze from international obligations. We encourage those living within range of these meetings to attend and express opposition to the proposals. We implore Southpoint to withdraw its 1400 megawatt wind project from Lake Erie and Lake St Clair. We encourage the Government of Ontario to re-establish a moratorium on offshore turbines until a clear policy that protects biodiversity and cultural values from industrial wind farms and other “green energy” initiatives is adopted. Finally, we urge the province of Ontario and the Federal government to thoroughly consider the consequences of offshore wind installations in the Great Lakes within the context of its international obligations and expectations through treaties, conventions and the International Joint Commission. Some "hunters," an Ottawa Councillor and others in the Ottawa area are whipping up a frenzy in the public media (CTV, CBC) about recent sitings of Coyotes within the city limits of Ottawa. This story repeats itself every few years, as these stealthy canids surface in broad daylight, evoking panic in some of the citizenry. The headline is often accompanied by a photograph of the teeth-baring, garbage-eating vermin. Quite frankly the reaction of some of the public and media to seeing a Coyote is totally exaggerated and misguided. Little is known about the actual Coyote numbers, though it is frequently reported that numbers are increasing by some ‘authority’ such as a City councillor. This winter (2010), there does appear to be a shortage of wildlife in the region, reflected in Christmas Bird Count results from the Ottawa and other regional counts. Trees and shrub seeds, often the foundation of the diet of many bird species and mammals over the winter are sparse this year. This might mean fewer of everything, including small mammals. This could be a contributing factor as to why we see the occasional Coyote wandering around – they are hungry. Are Coyotes dangerous to people? After the tragic attack on a young woman in 2009 in Cape Breton, we might conclude that they are. However, this is where we need some perspective. There were 17 attacks on people attributed to coyotes in Canada between 1988 and 2006, none fatal. In Toronto alone in 2006, 689 dog bites were “investigated.” In Toronto, 10 to 15 percent of the reported bites require sutures to close the wound. It is likely that the Cape Breton tragedy was an extreme aberration. Aberrant behaviour is something that is not restricted to humans or coyotes for that matter, but examples abound with numerous species; however with Coyotes, as with their close and larger relative the Timber Wolf, these examples, fortunately are highly exceptional. For many First Nations, the Coyote is considered “the trickster,” cunning, intelligent, a clown at times, and a wanderer. As a member of the dog family, native to North America, Coyotes habitat of choice are open grasslands and steppes of the mid west. Like many grassland species, Coyotes expanded across most of eastern North America as the forests were opened up in the 19th and 20th centuries. In fact, the Coyote has now spread eastward as far as Newfoundland, evidently crossing the channel between Labrador and the island. Coyotes are crepuscular or nocturnal, but certain times of the year are active during the day. About the size of a small German shepherd, they are opportunistic predators, often hunting alone, but sometimes hunting in packs. Coyotes have many characteristics that make them successful despite massive campaigns by wildlife control zelots to exterminate them. They are generalists in their food preferences, capable to killing small deer, but more often eating rabbits, ground hogs, meadow voles, bird’s eggs, carrion, and a wide range of plant food such as berries. Possessing an extremely acute sense of smell, keen eyes and excellent hearing as well as superior intelligence, coyotes are able to operate in as cities, as long as there are green spaces with potential den sites, cover and access to food. Coyotes are believed to be normally monogamous and mate in February or March. Gestation takes about two months, after which three to seven pups are born. Likely in cities, coyotes are important predators of nuisance rodents such as rats and mice. Coyotes are also known to breed with feral dogs. The offspring are called coydogs. Coyotes also likely breed with wolves where their populations overlap. Coyotes are an integral part of our ecosystems including urban ecosystems. The highly subsidized populations of urban wildlife such as squirrels, geese, rats and mice are the staples of the urban coyote’s diet. They bring net benefits to wherever they occur, though like all creature including ourselves, they are not perfect and there are occasionally aberrant or ‘bad’ individuals. We should not be alarmed when we see a coyote in the ravine, or even walking on a city street. If the behaviour is aberrant, yes, we need to act. However, we do need to keep better track of our own pets and treat them with the respect and care that they deserve, which includes not letting them wander freely and not exposing them to dangers.